We have perhaps all dreamed of travelling the world at some point, swapping the humdrum of everyday life for more exotic surroundings. But one way or another, everyday commitments tighten their grip, from the nine to five to the school run, not to mention the financial implications of packing up and leaving everything behind. Dreams of far-flung destinations become simply that – dreams that we resign to a “one day” list at the back of our minds. But for Lynne Mennie, one day might never come, and a quick conversation with her husband, Alex, saw the couple leave their home in Cove and go travelling for almost a year… with their two sons in tow. From eating barbecued rat to risking getting caught up in a tsunami, life has never quite been the same, and Lynne is preparing to go off on her travels again after falling in love with Mexico. She believes that everyone should take up the opportunity to travel if given the chance, and only returned to the UK after funds ran out. “It was a very sudden decision to go travelling – I think it took us about an hour to decide in the end,” said Lynne, who is a project manager. 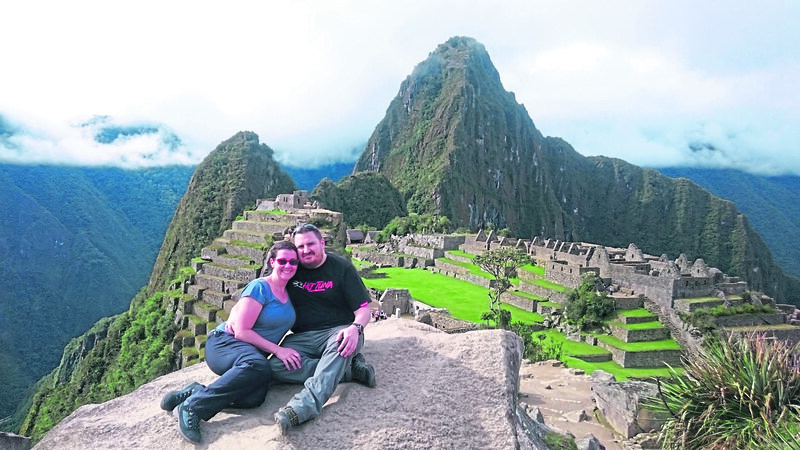 “We didn’t do months of planning and we left having only booked our first week of accommodation and flights to Peru. “Alex worked in the oil industry when he was made redundant, and near enough at the same time, I was offered a chunk of severance pay. “We decided that rather than go all doom and gloom, we’d take advantage of this and head round the world. “We went and had a chat about it to the kids and made up our minds that we wanted to do it. The family left Scotland in the middle of February for what turned out to be quite the adventure. Their tour included South America, North America, Peru, Mexico, the Galapagos Islands, a road trip across the States and travelling around South East Asia. They also visited Japan and Hong Kong. “The boys were 14 and 12 at the time,” said Lynne. The family stayed mainly in youth hostels during their travels and had their fair share of hair-raising experiences. “We had the backpacker experience – we certainly didn’t stay in lots of lovely hotels,” said Lynne. “It was very much on the hoof. “One experience in particular stands out. We were on a bus in Peru. The driver actually fell asleep at the wheel and he only woke up when the bus went off the road. “Thankfully it wasn’t in a section of road where there were massive canyons either side! The family also managed to miss an earthquake that hit Ecuador one hour after they left the west coast. They were then told that they could be in the path of a tsunami. “It was pretty scary, but at the time you just get on with it,” said Lynne. “We also had lots of amazing experiences. “The boys got a pretty impressive biology lesson on the Galapagos Islands, where we were able to show them Darwin’s finches. “Cambodia was absolutely fascinating, and I also learned to weave whilst travelling through Asia. “I didn’t speak the language and the women who taught me didn’t speak English. Lynne has continued to weave upon her return to Scotland, and is due to travel to Mexico next month after receiving funding from the British Council as part of its Crafting Futures scheme. The initiative supports crafts around the globe. But how did the family fare upon returning to the UK? “It was a big shock to the system to be home; Alex returned to the oil industry and the boys went back to school,” she said. “I think the experience has brought us a lot closer as a family. “Travelling together is a concentrated version of day-to-day life. “There are no escape valves like work or school and you have to be quite confident in your relationships. “The boys were at an age where they were starting to wonder what it meant to be an adult. “They were starting to ask questions and we had some rather entertaining conversations. “That closeness has continued in the UK. “If the boys decide that they don’t want to travel in the future, I can be content with that because they’ve had the experience and made that decision for themselves. “I would say that if you want to travel and have the funds to do so, don’t hesitate.